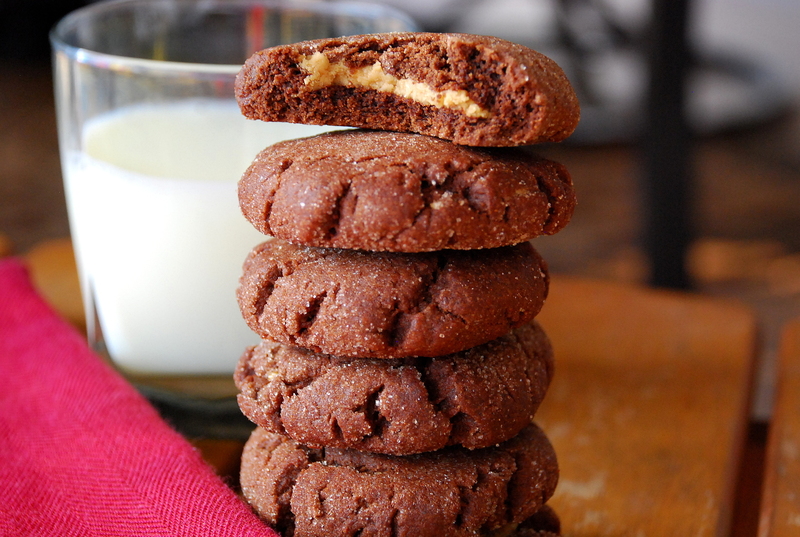 Who can resist a peanut butter cup in cookie form? Chocolate and peanut butter happen to be two of my favorite ingredients, so why not stuff ’em together in one cookie? These are one of the few cookies I make every single year. They’re a crowd pleaser and different enough that folks take notice of them. Whisk the flour, cocoa, baking soda and salt. Set aside. Use an electric mixer to beat the granulated and brown sugars, butter and 1/4 cup of the peanut butter until light and smooth. Add vanilla and egg, beating one at a time to combine. Gradually stir in the flour mixture. Dough will be very thick. To make the filling, cream together the powdered sugar and remaining 1/2 cup of peanut butter until smooth. To assemble the cookies, spoon a heaping tablespoon of chocolate cookie dough onto wax paper or silpat. Flatten into a circle with your hands. Scoop about 1/2 teaspoon peanut butter filling and place in the center of the chocolate dough. Wrap the chocolate dough around the peanut butter filling, pinching ends together to seal. Roll the cookie in between hands to smooth into a ball. Repeat until all dough is rolled. Roll balls in cinnamon-sugar and place on a silpat or parchment-lined cookie sheet. 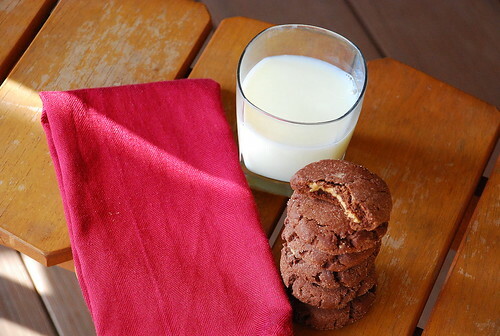 Use the bottom of a glass to slightly flatten the cookies. Bake for 8 to 10 minutes or until puffed and crackly. Do not over bake. Let cool on wire rack.